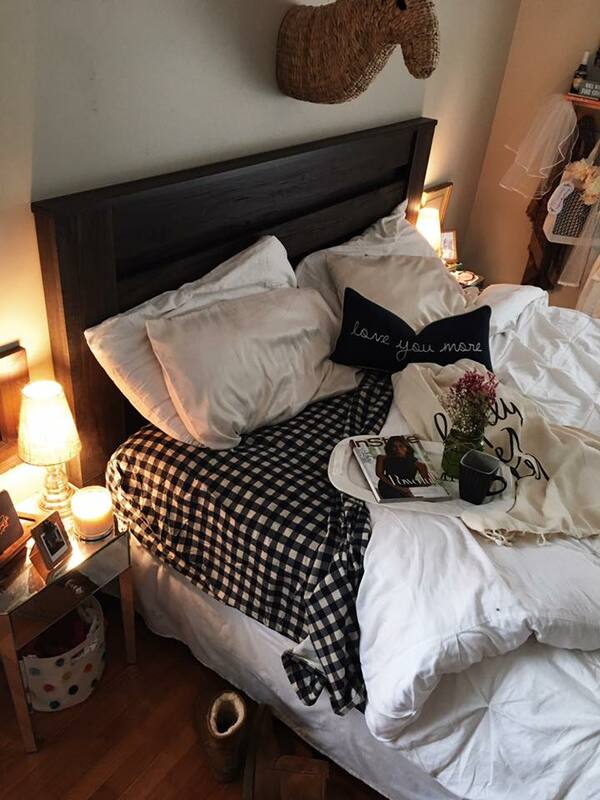 I don’t know about y’all, but I would give anything to be crawling back into this bed right about now. One part of Fall I particularly love is the way I can snuggle up at night without waking up feeling like I’m in the Sahara desert. I’m one of those people who love a soft bed. If I could sleep on a cloud, I think I would be the happiest girl in the world. 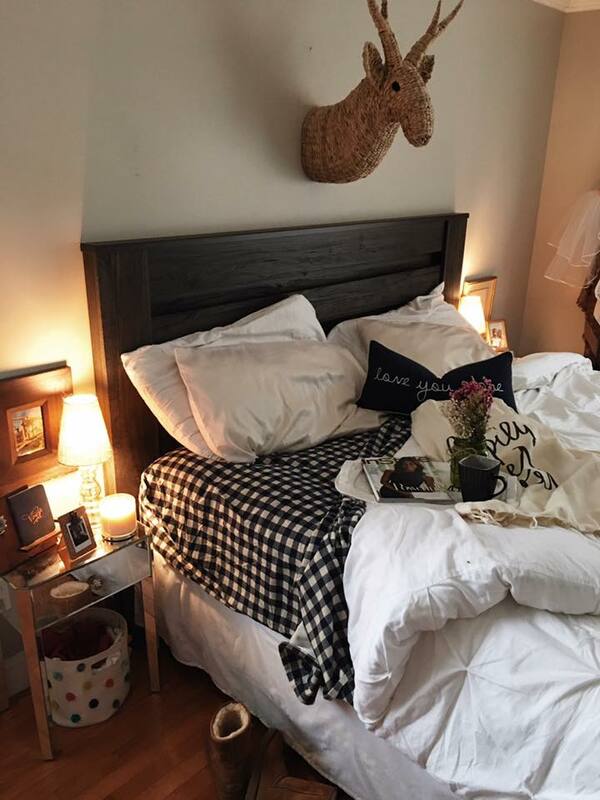 During the Spring and Summer, I like to keep crisp white sheets and a light quilt on the bed but nothing makes me feel like a little kid on Christmas morning more than swapping out for the flannel sheets! Maybe you’re one of those people who loves to break out the Christmas decor the day after Halloween (Hey, I’m right behind you! Give me about a week and I’ll have ours out!) 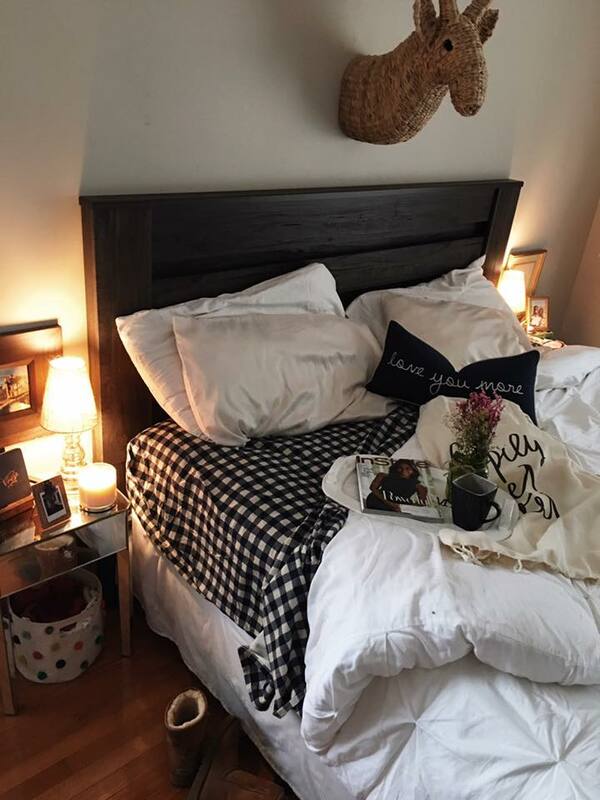 or maybe you like to wait closer to December and really soak in all the Thanksgiving glory, no matter what your thing is you can start to get in the holiday spirit by cozying up your bedroom! 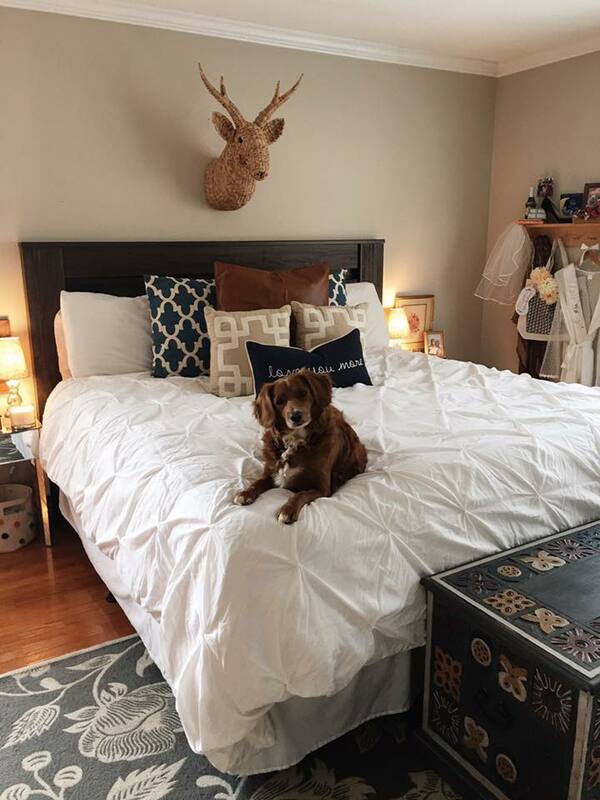 I’m sharing some easy steps how for ya today + a few tricks on how to keep white bedding with two pups (or messy significant others, kids, or all of the above), Happy November babes! 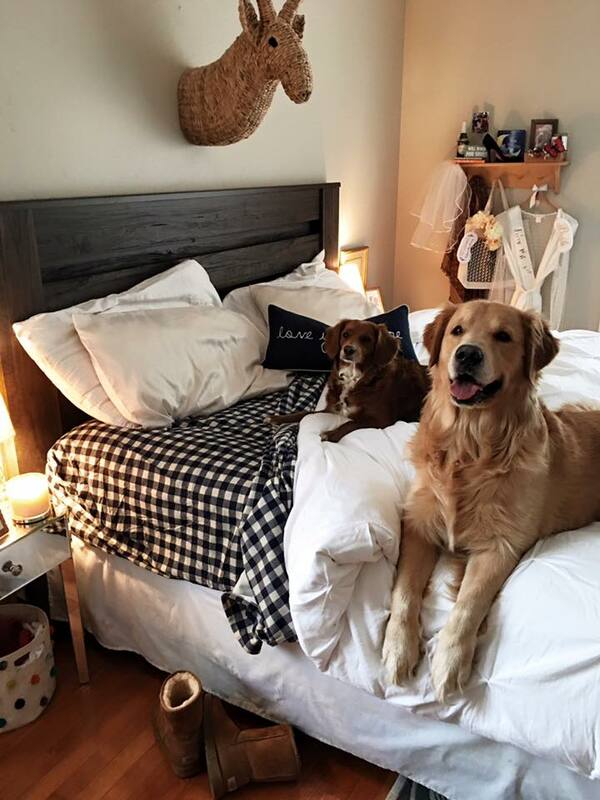 Beware, you may never ever want to leave your bed! You can’t blame me if snooze becomes your BFF. 1. Down Alternative Mattress Topper — This is my favorite thing ever. We have a Temperpedic mattress which Babe loves but it’s a tad too stiff for me. 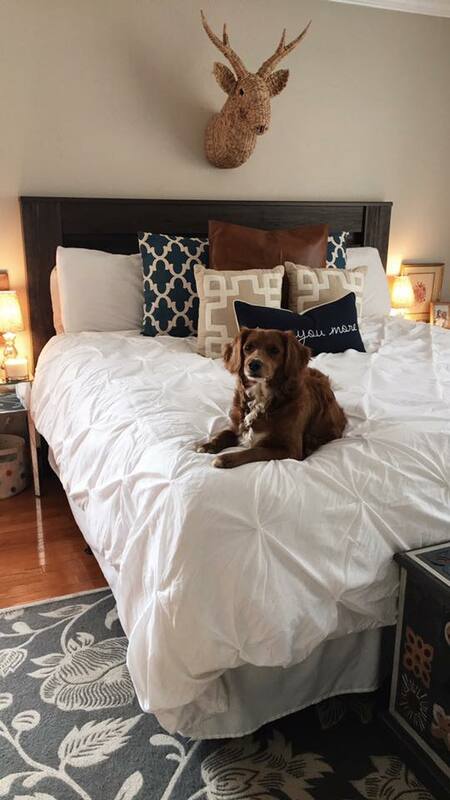 To keep it fair, we do the Temperpedic in the Spring and Summer, then the pillow top in the Fall and Winter. 2. 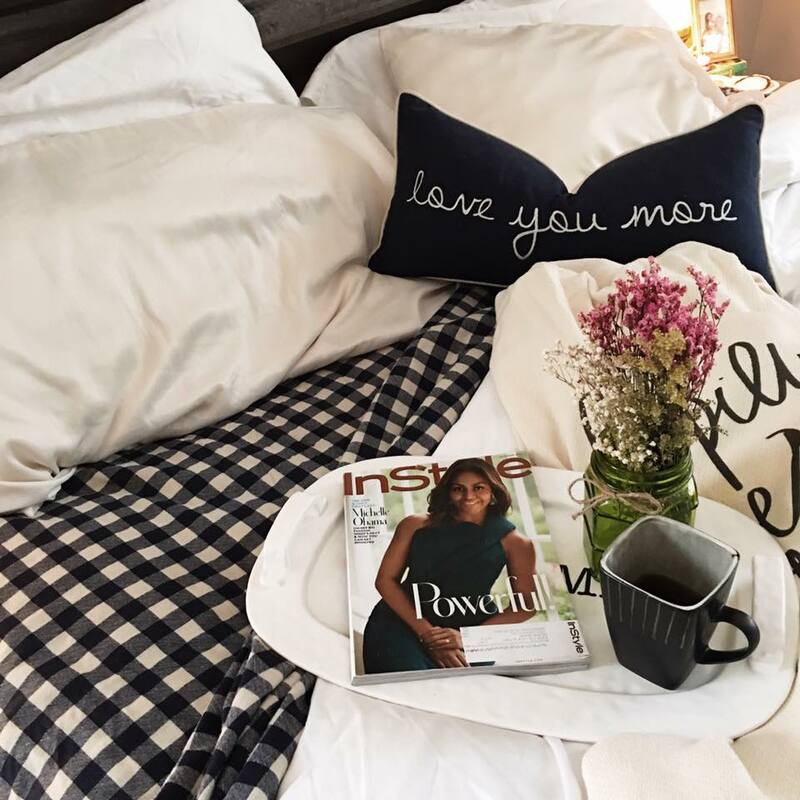 Flannel Sheets — Swap out your Summer sheets for these uber cozy, super festive flannel cuties. 3. Silk Pillow Cases — I have the absolute most sensitive skin in the world. If I sleep on my arm or hand or anything that isn’t my pillow case, I break out. I switched to silk pillow cases earlier this year and I’ve noticed the biggest difference in my skin + it helps my hair from breaking, helps hold my hair style, is better for your eyelashes and feels so luxurious. Babe got jealous and now he has one, too. Even Doodle sleeps on a silk pillow case now, I swear she’s the most spoiled pup in the world! 4. Down Comforter + a Duvet Cover — This is not only my favorite part but the trickiest!! 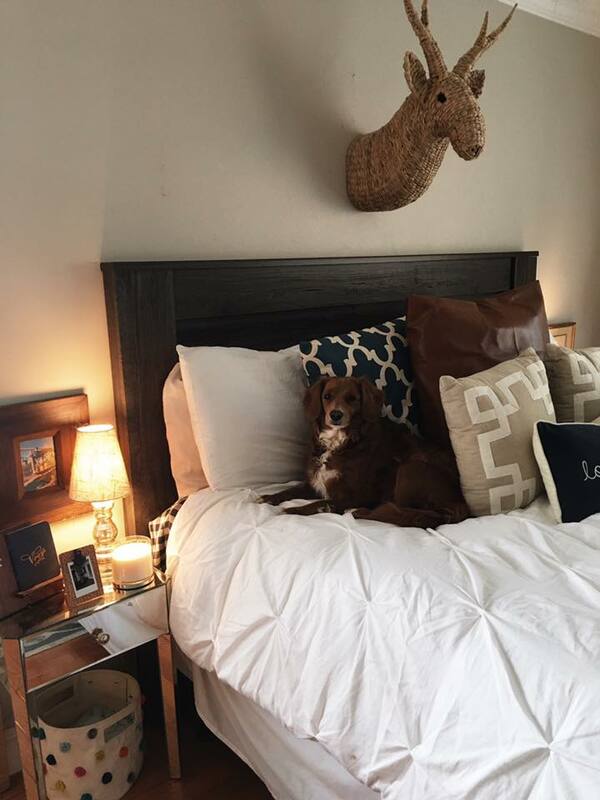 I have mastered a few tricks over the years that help you mix white bedding + pups (or whatever hooligans you have at your house, messy bed eaters I’m looking at you!! JK I’m totally guilty of that, too). First, a down comforter is one of my favorite things I’ve ever owned. Something about the weight is so soothing, but at the same time it’s so cozy. You must, must, must get a duvet cover. 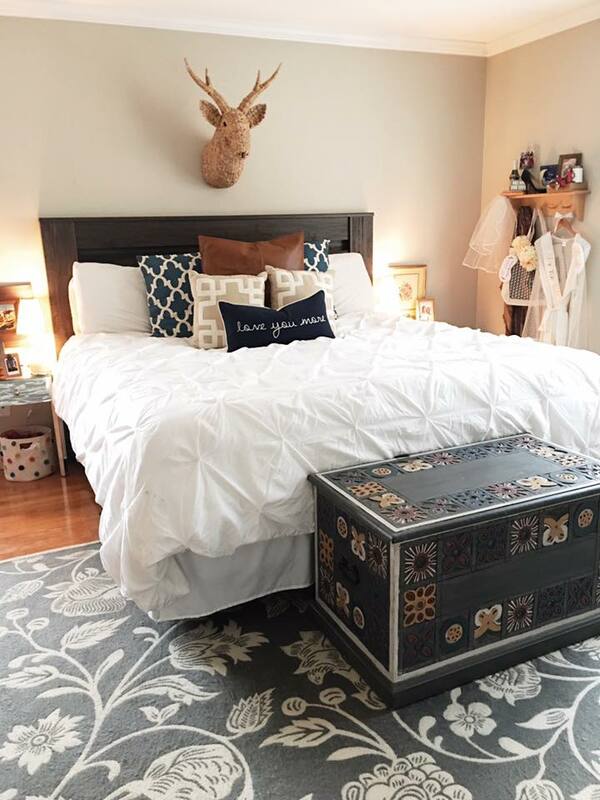 Not only does a duvet cover help you change up your style each season, it helps you keep your bed clean without washing your bulky comforter each week. It’s so, so hard having a white duvet cover but I love it. We have a red clay mud in our backyard and if it’s even slightly damp outside, it gets all over the dogs’ paws and all over the house. I’ve found that Costco brand detergent is the best at getting this stain (or any tricky stain) out of fabrics. No, this isn’t sponsored I just had to share, it’s my favorite! Sometimes a stain needs two washes but it says ‘Whitest Whites’ on the box and it ain’t lyin’! Lastly, there are few things I hate more than putting a duvet cover on a duvet.. seriously they need to invent a machine that does it for you! In the meantime, this YouTube video taught me a trick that has been a lifesaver. 5. Fall Candles — A no brainer right?! This one is my favorite right now. I stick them everywhere this time of year! Nothing beats the sweet cinnamon smells that Fall brings, it reminds me so much of Thanksgiving dinner and baking cookies with my Mama. I’m excited to share more ways on how we transition our home during the holidays. This year I’m all about easy, but not too simple since this is our first holiday season as a married couple! We will be spending Thanksgiving on our honeymoon, so I’m trying to decide if I want to decorate for Christmas before or after we leave. I think I’m leaning towards before!! I cannot believe it’s officially our wedding month! I’m so happy it’s here, you have no idea. I hope you had a fabulous Halloween. We had a few trick-or-treaters and the pups loved it. I made Babe some delicious, soft and thick chocolate chip cookies. I’m so impressed with how they turned out, I’ll be sure to share them here in a couple weeks. I don’t think I’ll ever be able to make cookies another way again.